For those interested in hiking through a rainforest, viewing a wide array of wildlife, and watching cascading waterfalls, La Paz Waterfall Gardens has it all. Located on the eastern edge of the Poás National Park, just 12 miles north of Alajuela, this 70-acre, privately owned ecological park is one of the top tourist destinations in the country. It includes two miles of beautifully maintained walking trails with conveniently placed viewing platforms that highlight the five different waterfalls of the Río La Paz. In addition, there are 10 fascinating animal exhibits, an orchid and a hummingbird garden, and the country's largest butterfly garden. Although there are plenty of tour companies based in San José that offer half- and full-day trips with a stop at La Paz, the park can be easily explored with any of the self-guided tours that begin at the visitor center. The self-guided tours also allow you to go directly to an area of your interest instead of following a fixed itinerary led by a tour guide. But if you prefer more information along the way, guided tours led by informative and bilingual guides are also available. 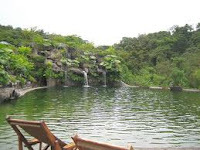 La Paz Waterfall Gardens is open all year from 8 a.m. to 5 p.m. If you are not arriving with a tour company, then the best way to get there is by driving. The park is located approximately 3.75 miles from the town of Vara Blanca. Once you reach the town, you will begin seeing the well-marked signs. Waterfalls - The trail from the visitor center includes a series of metal stairways that descend into a steep canyon with viewing platforms near each of the waterfalls. 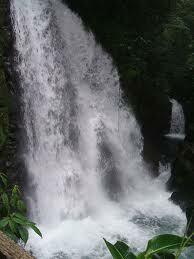 The five waterfalls include: Templo, the 130-foot Magia Blanca, Encantada, Escondida, and La Paz. The lookout points allow you to get as close as possible to the falls, whether it is underneath or above them. 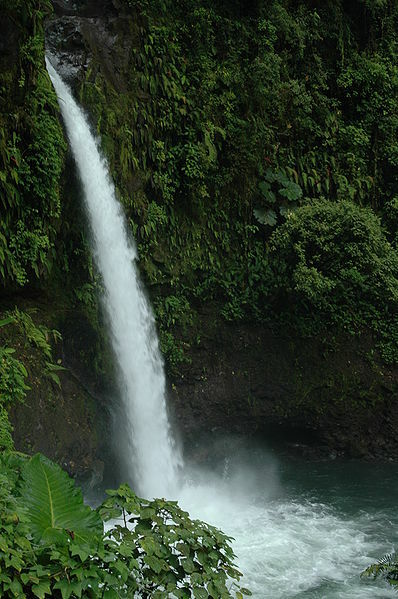 The trails end at the La Paz waterfall, which is one of the most photographed waterfalls in Central America. To fully enjoy the hike, try to give about two hours. For those who prefer not to walk back from the trail exit, there are free shuttles with the last one departing at 5 p.m.
Butterfly Garden - This exhibit is the largest of its kind in the country. 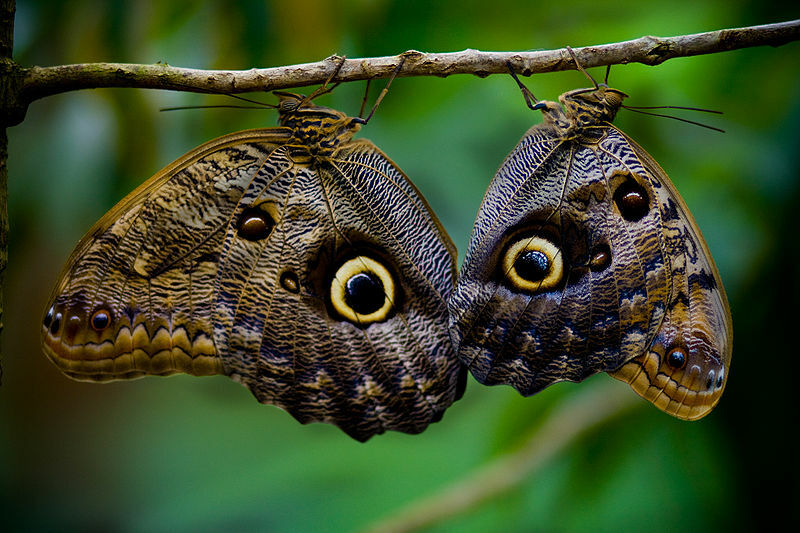 Even if you don’t really care about butterflies, it is still fascinating. The trail from the visitor center leads directly to the Butterfly Garden, which includes a multi-level, screened observatory. Hummingbird Garden - With plenty of feeders, you are guaranteed views of at least 26 documented species of these fleeting birds as well as a number of other colorful, winged creatures. You can also watch the hand feedings that occur twice a day (usually in the morning and afternoon). Jungle Cats - This is the newest addition to the park. It includes 35 felines that were once part of a previous wildlife center that lost its funding and closed. 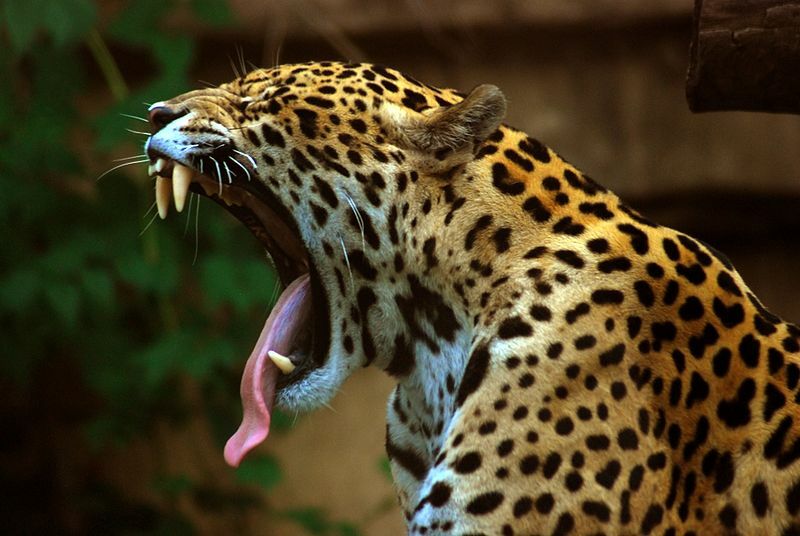 Highlights include a 200-pound Jaguar as well as five out of the six species of endangered Central American cats. There is a small additional admission fee but it goes toward supporting this important center. Serpentarium - This exhibit includes approximately 30 venomous and non-venomous snakes in the country. Highlights include the Golden Eyelash Viper, the Bushmaster, and the Green Vinesnake. La Casita de La Paz - This cute little house is a reproduction of a typical farmhouse that once belonged to a farmer more than a century ago. 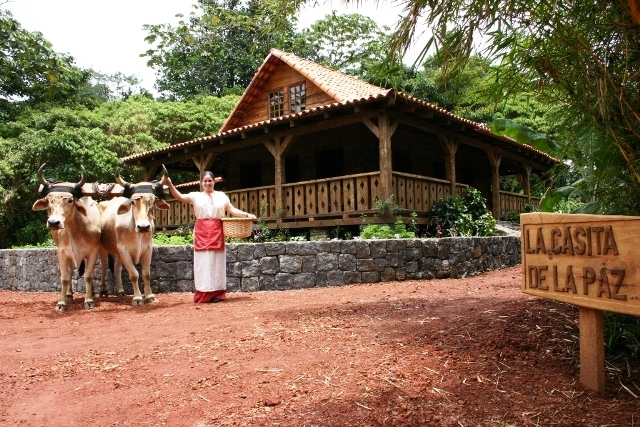 With the right timing, you can sample typical food, take a ride on an oxcart, and visit the farm animals. 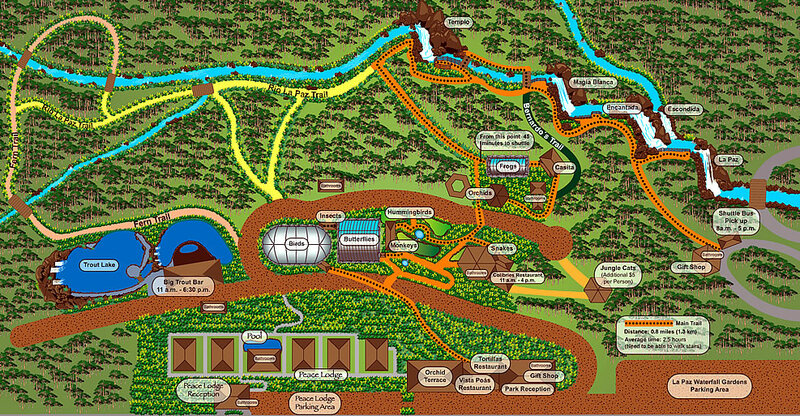 Aviary - Here you will see everything from toucans to macaws. Again, this refuge is for wild birds that were once illegally captured and confiscated by the government. The toucan exhibit allows visitors to hand-feed the birds after they land on your arm. Monkeys - You will see a variety of local monkeys that include the Marmoset, Spider, and White-Faced monkeys. All of the monkeys, donated by the Costa Rica Ministry of Wildlife, were confiscated from people who once held them illegally. Many of them have been rehabilitated and are now thriving. Trout Pond - This man-made trout pond allows both fishing and swimming. The lake is stocked once a month and both fly- and spin-cast rods are available. If you prefer to not get wet, there is the Big Trout Bar, which offers delicious meals and a variety of drinks. Although the price of admission to the gardens is a little high (approximately US$32 per person), it is worth it. Just take your time and appreciate the fact that the majority of the proceeds go back toward the rehabilitation of these endangered species. don't notice this. You should continue your writing. I am confident, you have a huge readers' base already!